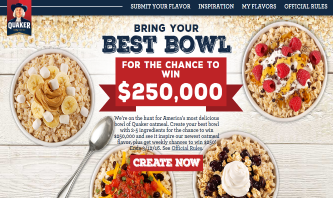 Quaker Bring Your Best Bowl Sweepstakes – Win $250,000! ENTER SWEEPSTAKES HERE – Quaker Sweepstakes page. ENTRY LIMIT – You may enter as many different Entries into the Promotion as you like, as long as the same (or substantially similar) is not submitted more than once. ELIGIBILITY – The Promotion is open only to legal residents of any of the 50 United States, D.C. or Puerto Rico, who are 18 years of age or older at the time of entry. SWEEPSTAKES ENTRY PERIOD – Entries must be received between 8:00:01 a.m. Central Time (“CT”) on December 15, 2015 and 11:59:59 p.m. CT on March 12, 2016. PRIZES – Thirteen (13) Weekly Sweepstakes Prizes (awarded one (1) per Weekly Sweepstakes Period): Each Weekly Sweepstakes Prize winner will receive a $250 pre-paid debit card. Finalist Prizes (2): Each Finalist Prize winner will receive Five Thousand Dollars ($5,000), awarded in the form of a check or wire transfer, payable to winner. ARV of each Finalist Prize: $5,000. Grand Prize (1): The Grand Prize winner will receive Two Hundred Fifty Thousand Dollars ($250,000). Awarded in the form of a check or wire transfer, payable to winner. ARV of Grand Prize: $250,000. Alicia – to enter the sweepstakes you need to go to the Quaker Oats Sweepstakes page. Leaving your recipe idea here on my blog does not enter you in the sweepstakes, as I only share sweepstakes – I don’t run them. Tonia – you need to click the link and submit your ideas at the Quaker Sweepstakes – leaving them here does not enter you in the sweepstakes. I just share sweepstakes, to enter them you must go to the sweepstakes pages and follow the directions to enter. Good luck!